The Beck Family. High Park Dairy, 189 Park Road. (© Brian Phythian 2017). Fascinating stories and not just dates inspire research into family history and it throws up ancestors who arrived in Liverpool from Westmorland at the end of the nineteenth century. Many of the families seemed to move south in the 1870’s and 1880’s and the reasons for this are well documented (see references below). ‘The sudden collapse of their means of income, coupled with the knowledge that it would take years of hard labour and deprivation to re-build even the most modest of small holdings forced many of the hill farming communities to make far reaching decisions in order to survive’. (see references for article by John HOLMES). That choice was to move to Liverpool, a fast-growing city and sea port during the Industrial Revolution, knowing that milk would be required to cater for the rapid growth in population. Once in Liverpool, our branch of the ALLEN family lived at 189 Park Road, Toxteth Park which, despite the address, was set back at the end of Ellis Place between the pub and Woolworths at the top of the hill opposite Wellington Road. It became known as High Park Dairy. From the front windows the vista across the city taking in the rooftops and the Liverpool Anglican Cathedral was magnificent. However, the location created problems when the UK censuses were conducted and the family was often missed off. This has led to the ALLEN family being omitted in many articles referring to cowkeepers resident in Liverpool, and as I endeavour to put this right, there were quite a few to be found in the city. The house in Park Road had been a farm for many years. As early as 1875 it showed in the electoral register with Joseph Raine as occupant, and later a cowkeeper, John Akrigg is present in 1881. There is a tenuous link, one not yet established with any conviction, that the Akrigg family at 189 Park Road are linked, via the SHELDON family by marriage, with the ALLEN family, so I can only say with some certainty that when Thomas WOOF moved south to Liverpool between 1877 and 1881 with his widowed mother, Margaret (CAPSTICK), and nine siblings to live at 28 Avison Street, Toxteth Park, it was the start of cowkeeping and supplying milk in the area for the next ninety years. The family were raised in Firbank, Westmorland. Firbank is a parish in Lonsdale Ward in the South East of the county. It adjoins the West Riding of Yorkshire. It was formerly part of Kirkby Lonsdale parish. His father, William WOOF, had died in Firbank in 1871, where the family had farmed for many years at Moors farm. The siblings of Thomas WOOF did not all relocate to Liverpool. His elder sister, Isabella WOOF, married in 1878 in Sedbergh, historically part of the West Riding of Yorkshire, to John CLOSE, a cowkeeper and milk seller from Orton, Westmorland, and they are recorded in 1881 at 121 South Street, Toxteth Park. By 1891 they had moved to Biddulph Hall Farm, Biddulph, Nr Congleton, Staffs where they farmed for many years whilst raising twelve children. It was here in 1916 that her mother, Margaret, died aged 84. Ann WOOF, married in 1875 in Sedbergh to Matthew WHITFIELD, also a cowkeeper and once in Liverpool they lived at 53 Tegid Street, Everton, from 1881 until Matthew’s death in 1898, when she moved to 14 Osborne Grove, Queens Road, Everton. Ann and Matthew had eleven children, and the census showed they all helped on the farm. When Ann died in 1930 her burial record shows her address as Tegid Street and her probate as Osborne Grove; so, it’s possible one of her children took over her former address whilst she retained ownership. Mary WOOF married William Robert SHINKFIELD in 1884 at Wesley Chapel, Stanhope St, Liverpool and they took over the family home at 28 Avison Street after Thomas moved to Park Road. With their two remaining children, William Robert SHINKFIELD and James Woof SHINKFIELD the family emigrated to Australia in 1892 and remained there all their lives. Unfortunately, their third son, Thomas Norman SHINKFIELD, died when a baby in 1890. Margaret WOOF married William METCALFE in 1878 at Sedbergh Parish Church, Sedbergh and after 1881 when they are still in Sedbergh, I have been unable to locate them on passenger ships, to ascertain possible emigration, or on BMD records. Consequently no further details on them are known. Alice WOOF lived at the family home in Avison Street but when she died as a spinster in 1890, at the home of her brother James at 95 Upper Warwick St, Toxteth Park, she was single and only 25 years of age. James WOOF was head of the household in 1891 at 95 Upper Warwick St, Toxteth Park, and had his mother and two younger siblings, William and Sarah Jane were with him. James was a baker and Sarah his assistant; William worked as a clerk. James married Sarah RAWLINSON in 1892 but he died suddenly in 1896 at just 29 years of age. Sarah moved to Blackpool after James’s death but emigrated to the USA in 1902 with her daughter, Dorothy, to her brother John’s home in New Jersey. Sarah WOOF married William Thomas GRINDLE in 1892 at St Peters Chapel, High Park St, Liverpool. The Grindle family were not cowkeepers; William had his own chandler’s shop at 276 Breck Road, that many of his eight children later assisted running. Thus, by 1891, Thomas WOOF had solely relocated to 189 Park Road as an unmarried cowkeeper. He married later that year to Isabella Janetta HAYGARTH at the Wesley Chapel, Stanhope Street, Liverpool. He was there a short time as he and his family emigrated to the USA in 1902. His second son, Thomas Christopher WOOF, was born in 1895 and died when only 10 months old. Whether this triggered Thomas to look for a healthier environment across the pond for his family is not known, but he certainly chose different employment in Iowa by building what was to become a very profitable grain silo. The house was ably taken over by his sister, Agnes WOOF, who by this time was married to Miles William Joseph Lonsdale BECK. The BECK family lived in and around Skelsmergh, a small village in Westmorland just four miles north-east of Kendal, and geographically close to from Firbank. The BECK family were mainly cowkeepers, which Miles was when he relocated to Liverpool, but his siblings stayed in Skelsmergh and later turned to timber to make their livelihood. Upon arrival in Liverpool between 1886 to 1889, Agnes & Miles BECK at first lived with a cousin at 59 Farnworth Street, Kensington. Having been widowed in 1898 she was left with her nine children, aged from four to nineteen years, to raise as best she could which was extremely difficult and added considerable pressure on her. The family story passed down the generations suggests her husband, Miles, died happily, if not inconveniently, after inheriting a wine cellar and drinking the contents therein, particularly having a fondness for whisky. Agnes had moved into Park Road after his death and had the experience to manage the business following the departure of Thomas. Keeping the business going was no mean feat to start with for Agnes. She continued to build the business up and employed three men in addition to having some of her own family to help. The house continued to be run by the family for the next seventy years although during that period the lifestyle of the family eventually disappeared from our cities. At the time the streets beyond Dingle by Aigburth Road had just been completed by Thornton’s, a well-known building firm at that time. Much of the waterfront along the River Mersey from Dingle Point was still open land. Many of the cowkeepers in the area grazed their cows on the field at the Dingle, which was later used, for a short time, for oil containers. Her eldest son, Miles BECK, worked for her, and after marrying Sarah STEVENSON in 1908 at St Peter's Methodist Church, Toxteth, Liverpool he bought the house behind the dairy at 23 Sefton Square, Princess Park. He literally had to walk down the garden, through the gate and he was at his workplace. Some of his sisters remained single and helped run the business with their mother. So how did the ALLEN family connection with 189 Park Road come about? Samuel ALLEN (1831-1894) was one of eight known children of Henry ALLEN (1798-1878) and Mary WINN (1798-1860). Samuel and Eleanor SAYER were married in 1857 at the Chapelry of Hawes initially setting up home at Hole, Garsdale in 1871 when he was a mine worker and a cowkeeper. From the birth dates and place of birth of their twelve children, Samuel and the family moved south to Liverpool between 1877 and 1881; only their last child being born in Liverpool. They lived at 34 Freehold Street, Fairfield, in 1881. It is interesting that only two of his brothers moved south during the same period. John and Henry, neither taking cowkeeping as a career but both working in a local colliery, chose Burnley, Lancashire in preference to Liverpool. Of his other siblings, Thomas started the grocery and provision shop in the main street of Hawes which passed on to his son Elijah and after one hundred and fifty years is still in business today and run by his great-grandchildren. His sister, Margaret, was handicapped and always lived with her parents; his brother, William, was a farmer and spent his whole life at Faw Head, Gayle, Nr Hawes and his brother, Cuthbert, remained at Beckstones, Hawes, Yorks. Between 1858 and 1881 Samuel and Eleanor (recorded on many records as Ellen) had twelve children and it was to be one of their grandsons who would go on to marry the daughter of Agnes Miles BECK. Their first child, a daughter Mary (1858-1891) born in Hawes married William HOLMES in 1876 at Garsdale Chapelry. 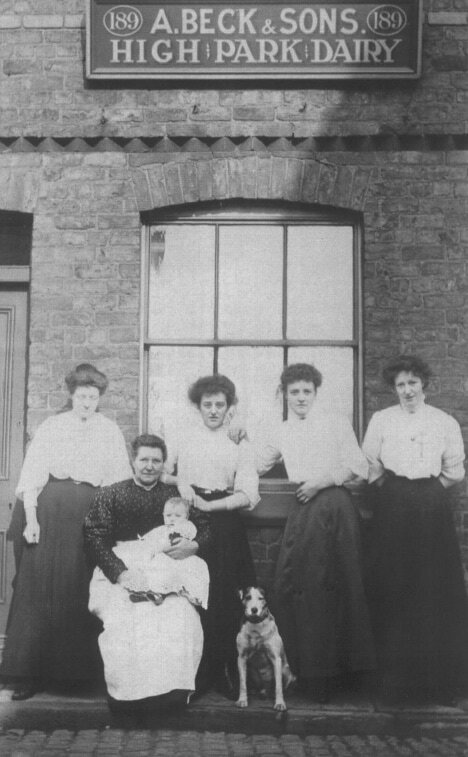 The HOLMES family were well established cow keepers and they had premises at 17 Mill Lane, West Derby, and Mary and William lived at 6 Russian Drive, Tuebrook. In a very interesting article, John HOLMES covered her life with her husband and nine children in detail (see references). Their second child was Felix SAYER ALLEN (1859-1933). He was born in Gayle, near Hawes​ and went on to move with his parents to Liverpool and there have a family of his own. But, more of Felix later; let's continue with his siblings. Henry ALLEN (1861-1913), the third child of Samuel and Eleanor, married in 1884 at Liverpool Register Office to Janet CARR. He set up his cowkeeping business after his marriage at 1 Langton Road, Litherland. Unfortunately, he lost his wife in 1900 at the age of 35 and Henry appeared to sell the business as he was back at his parents’ home at 34 Freehold Street, managed now by his married sister, Margaret in 1901. He still worked as a cowkeeping assistant and is with his brother Samuel in 1911 but he also died relatively early at the age of 52 in 1913. The fourth child of Samuel and Eleanor, his namesake, Samuel ALLEN (1863-1913), married in 1889 at St James, West Derby, Liverpool to Isabella DAVIS and he was already a cowkeeper upon his marriage, initially residing at 2 Rawson Road, Litherland, as recorded in 1891 and 1901. By 1911 the family had moved to 95 Gainsborough Road, Wavertree and the exterior of the premises still looks very much like a dairy and farm as it would have done at the time. Samuel also worked in partnership with his son-in-law, Fred TOPLIS, from another cowkeeping family and Fred was still at the address when he died in 1953. Samuel and Isabella had three children; Samuel ALLEN, obviously, a name within each generation, who was at 6 Russian Drive when his children were baptised; Ellen Elizabeth ALLEN, known as Nell, who married Fred TOPLIS and William ALLEN who is believed to have gone to Australia, but difficult to track down due to the commonality of the name. Samuel also died at a relatively early age of 49 just two years later in 1913. Isabella survived him and died in 1927 whilst living at 107 Barrington Road, Wavertree, at the age of 61. The next child of Samuel and Eleanor was their second daughter, Elizabeth ALLEN (1865-1925), who also married in 1885 at St James Church, West Derby, Liverpool to Benjamin WHITEHEAD. The WHITEHEAD family from Lancashire were also cowkeepers and dairymen. Elizabeth and Benjamin had two children, appropriately named Elizabeth and Benjamin WHITEHEAD. Their business was set up at 98 New Road, Tuebrook, where they were still operating from in 1911 when celebrating their silver wedding. Benjamin died in 1913 aged 51. Elizabeth died in 1925 whilst residing at 11 Holland Street, Fairfield. The next daughter was Ellen ALLEN (1867-1917) who married in 1889 at St James, West Derby, Liverpool, to John W NORTON, just three months after her brother when they were witnesses at Samuel’s wedding. John was a police constable at the time and he remained in the police force all his working life. However, the life meant relocating frequently and they lived in Mossley, Cheshire and Bury and Huyton in Lancashire. Ellen and John had two children, Allen and Lena NORTON. The couple also celebrated their silver wedding before Ellen died in 1917 aged 49 whilst living at 1 Shallot Street, Toxteth Park. Ironically when John died in 1927 whilst still residing at the same address his burial register entry records his occupation as cowkeeper, so perhaps a little more investigation needs to be carried out. The seventh child of Samuel and Eleanor is Thomas ALLEN (1870-1901). Thomas married in 1899 at St John the Divine, Fairfield, Liverpool to Margaret OWEN. Thomas moved to 1 Back Mount, Vernon Green, West Derby, and is duly recorded in 1901 as ‘cowkeeper and dairyman milk, own account, at home’. Their were two children from this marriage, Eleanor and David Arthur ALLEN. Unfortunately, he died later that year after just two years’ marriage at the age of 31, and Margaret moved in 1911 to 8 Macfarren Street, Stanley. His brother, Arthur ALLEN (1872-1900), also had a short marriage that only lasted four years as he also died at an early age, just 28. He married in 1896 at St John the Divine, Fairfield, Liverpool to Mary Harper and they also had two children, Samuel Herbert and Dorothy ALLEN. After his death, Mary returned home to Sedbergh with her two children and a year later married William Mason, a sheep and dairy farmer. Margaret ALLEN (1874-1925) was also a cowkeepers wife. She married Alfred Thomas WRIGHT in 1897 at St John the Divine, Fairfield, Liverpool. They initially took over the family farm at 34 Freehold Street before moving to 8 Garmoyle Road, Wavertree, where they remained until their deaths in 1925 (Margaret) and 1927 (Alfred). The tenth child of Samuel and Eleanor was John William ALLEN and the commonality of his name has caused a problem in identifying him in the records. He was born in Garsdale in 1876 and was with his parents in 1891 at Freehold Street, but nothing has been found since. The census and BMD records show too many John ALLEN to ascertain accuracy and further searching is required. ​Jane ALLEN (1877-1955) was the eleventh child and fifth daughter of Samuel and Eleanor and was the last to be born in Garsdale before the move to Liverpool. Jane married in 1898 at West Derby Register Office, Liverpool to William BATTY. William is the son of Richard and Isabella BATTY and the family had dairies across Liverpool. Jane’s cousin, also Jane, married William’s brother George Batty and the families are known to have had dairies at 20 & 22 Lance Street, Everton, 53-55 Arundel Avenue, 2 Prince Alfred Road, Wavertree, 14 Radstock Road, West Derby and 8 Victoria Terrace, Prince Alfred Road, Wavertree. William and Jane spent many years at 85/87 Aigburth Road (pictured in Dave Joy’s book [below]) as the inscription above the door is still present today. They moved to Whitehouse Farm, South Mossley Hill Road (below) before they both died within a few months of one another in 1955 whilst at Limedale Road, Mossley Hill. White House Farm, South Mossley Hill Road, Garston. (© Dave Joy 2017). ​The final known child of Samuel and Eleanor is son Winn ALLEN, born 1881 in Liverpool. Winn emigrated to Canada in 1902 and served in the Canadian Expeditionary Force in World War 1. He married Annie BARRETT in 1919 whilst living at 100 McCaul Street, Toronto, Canada. To date, no further information has been found. So, the breadth of Liverpool was covered with ALLEN family dairies. But let's pick up the story of Samuel and Eleanor's second child, Felix SAYER ALLEN. He was with his parents at 34 Freehold Street, Fairfield, Liverpool in 1881, a residence his parents maintained and ran their cowkeeping business from until his father’s death in 1894. Felix married Hannah SHELDON at the Parish Church in West Derby in 1884, but they appeared to return to Hawes to have their children. Following the birth of their first daughter, Ellen Elizabeth (1886-1934), in Liverpool, the 1891 census shows them at the home of Hannah’s brother in Gayle, with their second daughter, Mary Jane (1888-1950), son, Samuel (1890-1925), and son William Sheldon (1891-1940) all born in Hawes or Burtersett. Clearly, moving to Liverpool it did not stop them returning home as sons Felix Edward (1893-1943) and Philip Henry (1897-1917) were also born in Hawes or Burtersett. Perhaps Felix wanted his sons to play cricket for Yorkshire, but alas, it was the cowkeeping business in which most of his children became involved. Felix and Hannah set up their cowkeeping business at 466 Prescot Road and were there for approximately thirty years. They had relocated between 1911 to 1917 to 2 Laburnum Road, West Derby, when notified of the unfortunate death of their youngest son Philip, serving in the Royal Navy, who was killed in August 1917 as a direct result of enemy action in World War I. His mother struggled to come to terms with his death, and herself died in the following December. Felix was still in Laburnum Road in 1921 when his son William married and he died in 1933 at the home of his daughter Ellen. Their first child, Ellen Elizabeth ALLEN, married Mark VARTY, a cowkeeper, in 1906 at St Annes Church, Stanley, Liverpool. They had two children, Thomas Sayer Allen VARTY and James VARTY prior to Mark’s untimely death in 1908 after just over two years of marriage. They first lived at 6 Douro Place in 1907 and then at 2 Ronald Street, Stanley, in 1908. She was living with her uncle, Philip Sheldon at 6-8 Wren Street, Everton, and at 466 Prescot Road, her parents address, when she remarried at Christmas 1912 at Liverpool Register Office to Alfred Ernest ARMSTRONG, a postman. She died in 1934 a year after her father died whilst living with them. The second daughter, Mary Jane ALLEN, emigrated to Vancouver, BC, Canada in 1919. She married George Percival HALLAM and remained in Canada until her death in 1950. The first son was Samuel ALLEN, also a cowkeeper, who married Bertha Blanche Cannon in 1909 at Liverpool Register Office. The couple moved frequently at the start of their marriage, from 19 Ronald Street to 466 Prescot Road and finally to 2 Laburnum Road, West Derby, where he was when he died in 1925 at aged just 35. A fifteen-year marriage produced fifteen children of which at least seven died in infancy. The records, however, show Samuel as having sixteen children. Highly unlikely as he is recorded as father to Bertha’s last son born in 1927! Atkinson's Dairy. Heathfield Road, Wavertree. (© Mike Chitty, The Wavertree Society). ​The second son, fourth child, was William Sheldon ALLEN. In 1911 he was helping with the cows and milk delivery at the farm of Jane ATKINSON at 31-33 Heathfield Road, Wavertree. Whilst living at his parents’ home in Laburnum Road in 1921 he married Nora Minetta WELDON at Liverpool Register Office. He worked for many years as a cowman for his brother, Felix. He also had spells at 47 Beech Walk, Knotty Ash in 1924 and 16 Davidson Road, Old Swan in 1933. It was their third son, Felix Edward ALLEN, who went to work for Agnes BECK at 189 Park Road in 1909 at the age of sixteen. He ‘lived in’ as did the other employees in two extra rooms on an extra floor added to the original house. He fell in love with Agnes’s daughter, Ada Jane BECK, and they married at Liverpool Register Office in 1915 when he was on leave from the trenches. It is also rumoured that when the marriage took place neither family were happy and did not see the union lasting. The family had no real cause for concern as they bought the business from Agnes, who then went to live in North Hill Street, taking her unmarried daughters with her. Agnes BECK died there at the age of 77 in 1936. There were many years of hard work for Felix and Ada. They had twenty-one cows altogether, which had to be fed and milked twice a day. The cows were fed a bran mash mixture and a form of hops. It was mixed in large wooden tubs in the yard. They were also given plenty of water to drink and in return they gave very rich milk and cream. Unfortunately, at one period the cows had ‘foot and mouth disease’ brought in by a cow purchased in Ormskirk. The whole herd had to be slaughtered. In those days, no compensation was available, so it was a harrowing time for them, with five children to support, but survive they did. Felix employed his brother William as a cowman, keeping it a ‘family’ business as he also had five children. During the grim years of the 1930’s when there was a lot of unemployment, Felix often employed the friends of his eldest son, William Edward, if they needed work. Felix was not in good health by this time as he suffered from asthma, brought on by the conditions in the trenches during the war, and he had many bouts of pneumonia. Between 1930 and 1934 Felix introduced pasteurised milk and was the first to do so in Liverpool. His daughter, Rita, recalls the Public Health Inspector coming to the dairy to look at the installations for its introduction. There were six pieces of equipment costing £500, which was a heavy expenditure in those days. The equipment comprised a cold room, pasteuriser/cooler, washing up sink for bottles, a bottling machine, wash basin for hand washing and a separating machine for cream making. Alongside the shippon, the stable housed three horses used for delivering the milk, but a van was purchased to replace them. The van had to be scrubbed, disinfected and whitewashed throughout continually every day. Felix died in 1943 and it was his eldest son, William Edward ALLEN, who ran the business as a cowkeeper and dairyman until it closed in 1971 when, long after the cows had disappeared, the business was acquired by Hanson's Dairies. Ada Jane also died in the house of her mother in North Hill Street in 1950. But, the demise of the dairy after so long also brought an end to this branch of the Allen family, as William Edward ALLEN had two daughters who both married. In writing this article, it brings together, albeit briefly, not only the ALLEN family in Liverpool, but also links to many other cowkeeping families. I acknowledge the valuable input from Rita Pink (neé ALLEN), the daughter of Felix Edward ALLEN, family and friends.